NEPA points to a slip in defense as Cubit's culprit. 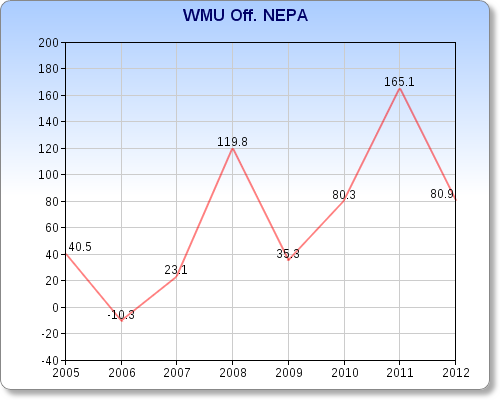 Normally in our NEPA rankings, negative is good, but I reversed that for graphical purposes, so negative is now... negative. Cubit inherited a bad defense but after one year turned them into an impressive unit with the help of his DC Scott Shafer. Since Shafer left - to DC at Stanford, then Michigan, now Syracuse - Cubit never found any kind of stability or leadership on defense. 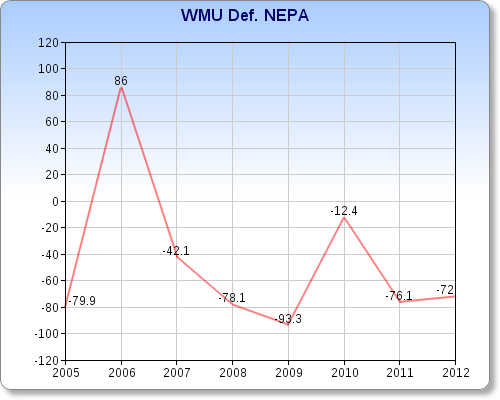 In the last 7 years, WMU has had 5 defensive coordinators, and Cubit's inability to find a replacement for Shafer ultimately led to his firing. Ironically, Shafer is now considered one of the early favorites to land the job. Cubit's teams were marked by bad timing. When Schafer got the defense going in '06, Cubit's offense was at its absolute worst. By the time the offense got to the point where it was ready to contend, the defense was in the pits, where it has remained. It's really a shame, because Cubit is an easy coach to like. He had immediate success, winning MAC Coach of the Year in his first season, and really built Western Michigan into a decent program. He recruited the area well, won some games against BCS competition, and generally made fans proud of the program. The firing surely wasn't an easy one to pull the trigger on, and as one of WMU's most successful coaches ever, he leaves relatively big shoes for his successor. With this move, the school is saying that they need to take the next step - simply being in contention for a bowl game every year, as Cubit was, won't be good enough anymore. They're looking at NIU, Kent State, Ball State, and Toledo, all with 10 win seasons within reach or already secured, and they want success like that. Luckily for them, Cubit managed to lay the groundwork for the right guy to come in and take them to that next level pretty quickly, if the right guy is hired. Of course, if Cubit's timing were better, he'd have been the right guy.